Thomson Reuters has created a nifty little tool to run your own stress test on the Eurozone banks. 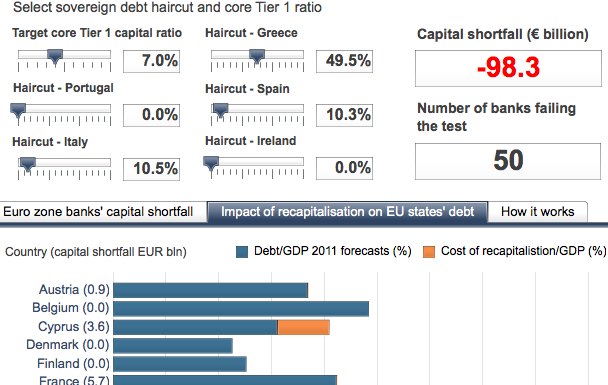 The “Breakingviews Euro zone bank stress test” lets you select haircut sizes for each of the PIIGS countries as well as your core tier 1 capital ratio of choice. In return you get the amount of capital missing in the Eurozone and the number of banks that will fail given the values chosen. The tool also lets you know how much capital is missing in each individual bank and what the cost of of a bank bailout would be for each country. See below for a snapshot of the tool in action. The good news is that no Swedish banks show up in the list of banks with capital shortfalls, sick no matter what (plausible) scenario I try, decease and neither does Danske Bank. This entry was posted in Economics, Länkar and tagged Banking, debt crisis, Eurozone, infographic, merkel, sarkozy, stress test, Thomson Reuters Corporation. Bookmark the permalink.